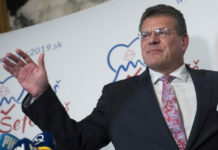 Bratislava, January 31 (TASR) – Maros Sefcovic on Thursday handed over 47 signatures from Smer-SD MPs, enough for his presidential candidacy (only 15 MP’s signatures are necessary). Sefcovic wants to focus on six priorities in his campaign. First, he wants to be a president with a human face, a president who’s as close to people as possible. Thirdly, he wants to be a president of a modern and prosperous Slovakia. His fourth priority is anchoring Slovakia in Europe. Regarding the fifth priority, he stated that he’s motivated to be a president of a society-wide settlement. „Today, more than ever before, society and the political scene need to return to normal communication and politics. I feel that Slovakia is weakened, almost exhausted by political struggles that provide grist to the mill of radical politicians,“ stated Sefcovic. The final priority concerns his wife Helena, who’s ready to become a dignified first lady and wants to dedicate herself to the weaker members of society. Sefcovic didn’t react to journalists‘ questions on Thursday, but he promised to organise an official press conference on February 4 at which he’ll answer every question irrespective of how long the press conference lasts.